The list of things to do as a kid growing up in most suburban cities in the U.S. can be somewhat challenging. Kids can try to scrape up enough friends for a basketball or football game, or, if they’re lucky enough, they can go to a friend’s house and play some ping pong. Skateboarding is always fun and popular, as is surfing, but unless the family lives in an area sympathetic to those sports, the “to do” list just gets shorter. Children growing up in San Clemente are lucky, they have a unique opportunity to hang out at a place where there are more things to do than there are kids to do them with. That place, right here in town, is an establishment where kids have free range over pool tables, ping-pong tables, foosball tables, etc. There are free arcade games, video games, a computer lab and a library. This facility has TWO gyms that run basketball or indoor soccer games almost constantly. This establishment is none other than our own Boys and Girls Club, officially, The Boys and Girls Club of the South Coast Area. There are Boys and Girls Clubs throughout the entire United States. What sets ours apart, comes in the form of a man who has gone above and beyond the call of duty to create an outstanding, standout facility here in San Clemente; Kent Campbell, the executive director. Kent first started working for the Boys and Girls Club in 1978, in Blount County, TN, after attending college in Indiana. A Purdue grad, Campbell was volunteering at a local Boys Club (the name was later changed to include both boys and girls) when he discovered there could be a career in helping kids, that it was not just something to be done on the side. After working for 3 ? years at the Tennessee club, Kent and his wife, Gail, decided they could use a change of scenery and decided to re-locate. Kent received a monthly newsletter from the Boys and Girls Club of America showing job postings all over the country. One listing had an opening for a club in San Clemente, CA, so the Campbells decided to give the place a try. After spending a few days in San Clemente to figure out if they could adjust, they decided it was the place for them. 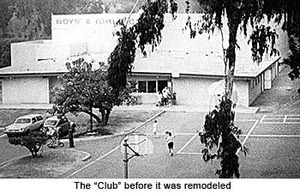 Kent started at the Boys and Girls Club of the South Coast Area in March, 1982. At that time, there were approximately 425 kids enrolled. The club’s annual budget was $78,000, there were three full-time employees and the facility itself was around 1,200 square feet. They held basketball, flag football and T-ball leagues for the kids and enjoyed moderate success. Soon, the sports leagues began to grow, and the participants numbers grew exponentially. At that time, the sign-ups for the sports leagues were held on a first-come, first-served basis. For an 8 am start time, it wasn’t unusual for Campbell to find parents in line who had been waiting since 5 am that morning, just to sign little Jimmy up. As these numbers continued growing, the need for space became apparent. Expansion was a must. In July of 1992, the club welcomed its newest addition, a 1000 square foot gym, complete with beautiful hardwood floors and monstrous, matching scoreboards. Built by the late Ray McCaslin, this gym continues to be a standout amongst Boys and Girls Clubs and makes some high school gyms pale in comparison. Campbell attributes most of his club’s success to an outstanding Board of Directors. This group continues to raise the monies that fund over 60% of their annual budget. These outstanding members of the community volunteer their spare time to gather and discuss ways to raise enough donations to keep the club running and successful. Via events like their annual Auction, Golf Tournament and a yearlong sustaining-membership drive, this group continues to exceed expectations year in and year out. Since Kent Campbell has arrived here in San Clemente, the membership numbers have risen to over 2,600 and there are eight full-time staff members to assist and supervise these children. The club runs on a budget of $725,000 and the facility itself boasts two gymnasiums and covers over 2,500 square feet. These numbers can be impressive, but to understand the impact that this club has on this city, you must take the time to visit. From opening to closing, there are activities going on the entire day. Both gyms have schedules posted with different games held almost hourly, and often there are tournaments held for prizes such as pizza, ice cream or other such goodies. The children actually wait for the club to open, and often the staff has a hard time closing down, with kids wanting to play one more game of basketball, or pool or just check out one more thing on the internet. When was the last time you saw a child that didn’t want to leave a day-care facility? Perhaps one of the largest benefits of the Boys and Girls Club of the South Coast Area is the diversity it provides. There are children from all walks of life there, interacting with each other all day long. Inside the club nobody cares where you live or what mommy or daddy does for a living. The children’s biggest worry is if you can make a lay-up, shoot a pool ball straight or zap the aliens with your space gun. As a parent in today’s society, one of the largest issues faced is what your child is going to be doing when you’re not around. Fortunately, here in San Clemente, we’re blessed with a one-of-a-kind place where you can take your children and rest assured that they’ll be in good hands. Peace of mind like that doesn’t come easily, but as long as Kent Campbell and the Boys and Girls Club of the South Coast Area are around, San Clemente has a safe place for their children to learn, live and prosper. Contact the Club or Kent Campbell at 492-0376.